100+ beautiful pre-designed modules to make your email campaign stand out. Hyper-intuitive visual editor to change the images, texts, colors, links, and more. Works with any ESP and supports all modern email clients. Watch the 5-minute video to see how Postcards works. Postcards is awesome. It allows us to design emails in minutes and know they work on all devices. It used to take our designers weeks to get them responsive with back and forth from our different teams. Quite literally has revolutionised the way I do email. Saves me so much time not having to fiddle around with html for ages! 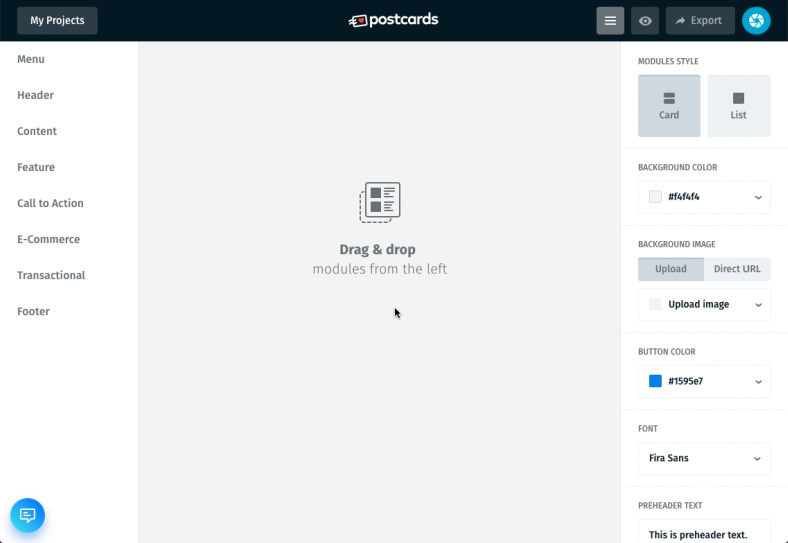 Postcards works the way all digital tools should work, easily and intuitively. Creating well-designed emails with Postcards is a breeze, which is quite a feat in a world of email clients. We started using Postcards about a year ago, and since then, we've created some pretty dynamic email templates and print layouts! The interface is super easy to use and our emails got a much-needed refresh. And, it's affordable—a great resource for us as a small non-profit. Postcards email builder speeds up my workflow while maintaining quality! We currently use Postcard in our growth team and planning to spread it across all the organization. Templates never fail a check test on Litmus, really a great tool!